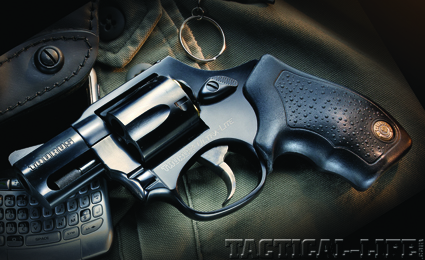 The new Taurus 380 Mini Ultra-Lite is one of the smallest and lightest centerfire revolvers available for law enforcement and self-defense. Chambering it for the .380 ACP cartridge allows the cylinder to be shorter, making for a shorter overall length. At a recent trade show, I was looking at a display of Taurus revolvers when in the row of small, snub-nose revolvers I saw something out of place: one of the revolvers looked shorter than the others. I picked it up and examined it. The hole in the barrel disclosed the gun was not a .22 LR. Then I noticed “.380 ACP” stamped on the barrel’s right side. Wow! A five-shot, 2-inch (actually 1.75-inch, I learned later), lightweight-alloy-framed wheelgun. It was in a caliber that allowed for a shorter cylinder and frame than comparable small-frame revolvers. I also recognized the little gun had no hammer spur, which increased its potential as a concealed carry weapon. I had a feeling in the back of my mind that I had seen something very similar to this in the past. In 1936, Smith & Wesson came out with a 2-inch-barrel version of the Regulation Police revolver in .38 S&W. Before S&W employed its model-numbering system to differentiate its weapons, the little revolver was dubbed the .38/32 Terrier. It was initially built on the short I-frame and then changed to the J-frame in 1960: the cylinder length went from 1.25 to 1.38 inches, and rounded front sights gave way to serrated ramp-style blades. I own an I-frame model (labeled the “Model 32” in 1957) made in the early 1950s. Comparing it side-by-side with the Taurus seems to present a case of grandpa and grandson. The Taurus cylinder, by the way, is 1.30 inches in length, allowing an overall length of just 5.95 inches, whereas the cylinders on today’s small-frame .38 Special revolvers are each 1.60 inches long with a correspondingly longer 6.94-inch frame. 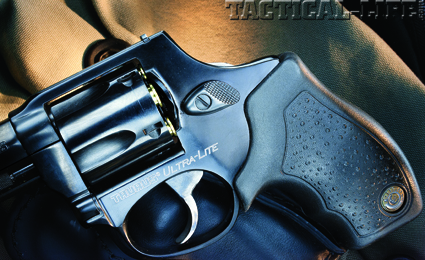 The Taurus 380 Mini Ultra-Lite is ideal for those seeking reliable performance in a short-barreled revolver without punishing recoil. My interest piqued, I contacted the Taurus marketing representative to place an order for what turned out to be appropriately enough, the Taurus Mini Ultra-Lite. I’m pretty sure that everyone reading this is aware that the .380 ACP was created for use in smaller-sized semi-automatic pistols. But revolvers chambering what are normally pistol cartridges have been around since 1917. S&W and Colt made large-frame revolvers in .45 ACP to supplement the military handgun supply in WWI due to the shortage of Colt Model 1911 pistols. In order for the revolver to eject the empty cases of the rebated-rim, semi-automatic pistol rounds, they designed a clip that fastened into the extractor groove of the cartridge case just above the rim, so the extractor would have a surface to engage when the ejector rod was pushed. This worked out quite well, and today there are revolvers chambered in pistol cartridges such as 9mm Luger, .40 S&W, 10mm and, of course, .45 ACP. 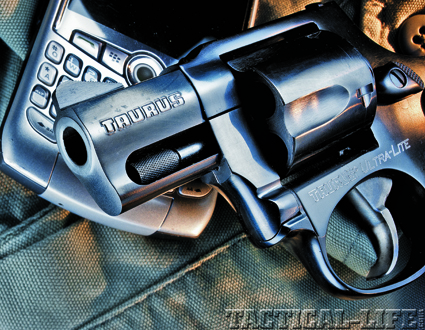 Now, thanks to Taurus, we have a .380 ACP revolver. With a short 1.75-inch barrel the Taurus has a correspondingly short ejector rod that pushes out only 0.45 inches, yet proved to be fully capable. Many holsters that work with a J-frame will also fit the Taurus 380 Mini revolver, such as these (left to right) Safariland, Galco and BlackHawk. My production sample of the Taurus Mini looks much like the original Taurus snubbie, the Model 85, only shorter. The test gun had a blue finish (a stainless steel version is also available), and its black soft-rubber grips have pebble-grained side panels and finger grooves that offer solid purchase on the handgun. 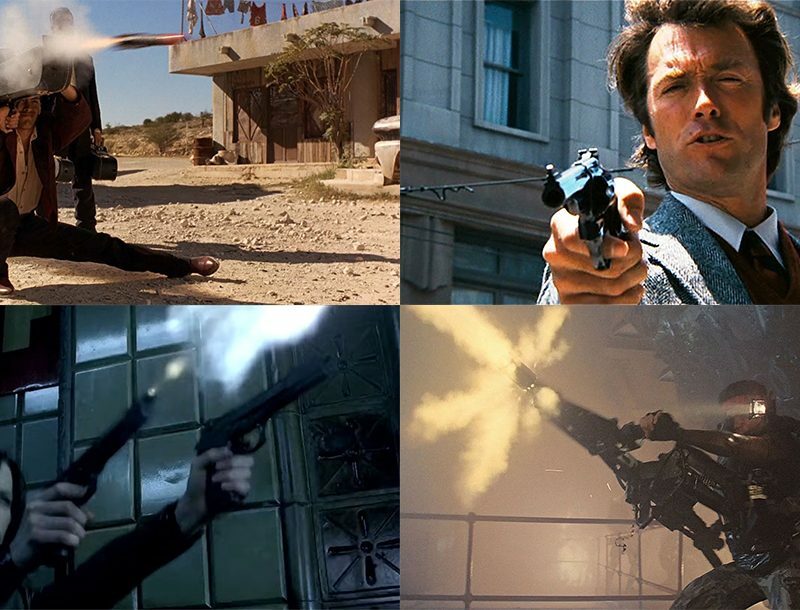 The gun uses a spurless hammer and a double-action-only (DAO) trigger. On the rear of the hammer is an aperture for the Taurus Safety System, which allows the action to be locked using a factory-supplied key that is inserted in the aperture and turned for activation. The trigger is color casehardened and rather wide with a smooth face. Something else a bit different is the windage-adjustable rear sight blade. It is mounted in a slot where the fixed rear sight notch is usually located, and a small screw in the frame’s right side provides for lateral sight movement. The front sight is a serrated ramp affixed to the barrel, which has an integral ejector-rod housing. Locking points for the cylinder are at the rear on the ejector star, and there’s a spring-loaded pin atop the cylinder crane that engages a notch in the frame, just below the barrel. Overall fit and finish are very good. The now-obsolete .38 S&W cartridge hasn’t been chambered in a handgun since the mid-1970s. 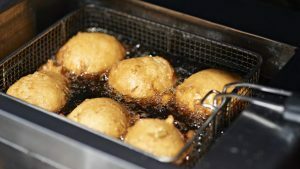 It was invented to fire larger, heavier bullets in small-frame revolvers and initially used in the hinged-frame revolvers introduced in the mid-1870s. The new Taurus, like the classic S&W Terrier in .38 S&W (top), has an abbreviated cylinder and frame because of the short length of its cartridge. Never a powerhouse, the short .38 S&W was loaded with a 146-grain, round-nose, lead bullet at what we today would consider a leisurely velocity. To up performance, a “super police” load with a 200-grain bullet was offered in the mid-20th century: called the .38/200, it was used by the British military in WWII and subsequently by the British police in England and throughout its empire for many years. Today, it is still produced with the 146-grain bullet by at least three manufacturers that I’m aware of, but performance levels are low to prevent anyone from blowing up grandpa’s old “lemon squeezer.” Today, for those who want a revolver with performance, low recoil and a short cylinder, the logical choice would be the .380 ACP round. The .380 ACP (also the 9x17mm, 9mm Kurz or 9mm Corto) has been on the scene for over 100 years. The traditional load had a 95-grain, fully jacketed bullet at around 950 feet per second (fps). Unlike the somewhat longer 9mm Luger (9x19mm), it was a low-pressure load intended for small pistols with blowback actions. Its performance has been greatly improved, gaining somewhat higher velocities combined with well-designed, controlled-expansion, hollow-point bullets normally weighing 85 to 102 grains. The .380 ACP can be surprisingly accurate, and due to the low pressures and bullet weights, its recoil and muzzle flip are modest. When I went looking around my ammunition locker for some suitable .380 ACP cartridges, I had quite a number to choose from. Some had been around for a while; others were recent arrivals. For a traditional-style load, I selected Federal American Eagle that had a 95-grain FMJ bullet. A much newer load was the DoubleTap with a 95-grain brass-jacketed HP. I also chose the Federal Classic 90-grain JHP bullet, a brass-jacketed Remington Golden Saber load packing a 102-grain projectile, and a Winchester Supreme Elite PDX1 in a 95-grain bonded JHP bullet. Lastly, I wanted to see what kind of performance I’d get from MagSafe’s 40-grain SWAT load, which was developed for home defense and had a 40-grain pre-fragmented bullet with a rated velocity of 1,650 fps from a 3.5-inch barrel. (safariland.com/dutygear; 800-347-1200) is the Custom Fit Model 567 made with SafariLaminate construction with a thermal-molded holster body, suede lining and an injection-molded belt loop plate. This is another open-top, but has upper and lower retention-adjustment screws. The belt-loop plate allows for different belt widths, angle of cant or crossdraw usage. With the Taurus Mini, holsters and ammunition packed in my shooting bag, it was now range time. I also took along my old S&W Terrier and a box of factory .38 S&W cartridges so I could do a little comparison. Somehow, I lucked out and didn’t experience the gale-force winds typical of springtime in central Indiana. I set up my Oehler Model 35P chronograph and got some velocity measurements. There was a big difference between the old .38 S&W and the more modern .380 ACP. Out of my 2-inch Terrier, the factory 146-grain RNL ammunition had an average velocity of only 544 fps, which is approximately 96 foot-pounds of muzzle energy. Out of the Taurus Mini, the DoubleTap .380 95-grain JHPs clocked in at 988 fps, which was equivalent to roughly 206 foot-pounds of muzzle energy—an improvement. I was impressed with the .380 ACP velocities from the Mini’s 1.75-inch barrel. 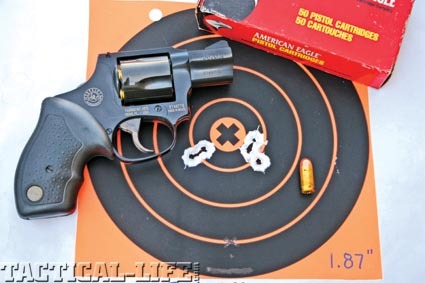 Test protocol for a snubbie revolver is five-shot groups from the bench at 7 yards. Considering the Taurus Mini’s rather heavy DAO trigger, this seemed a reasonable distance—it’s a strictly “across the bedroom” type of handgun. Full-moon or Taurus Stellar Clips are great when you need all five cartridge cases to eject simultaneously. But if you don’t, like during accuracy tests, you save yourself from having to pluck the cases out of the clips: load the single rounds in the cylinder, and knock out the empties out with a pencil later. 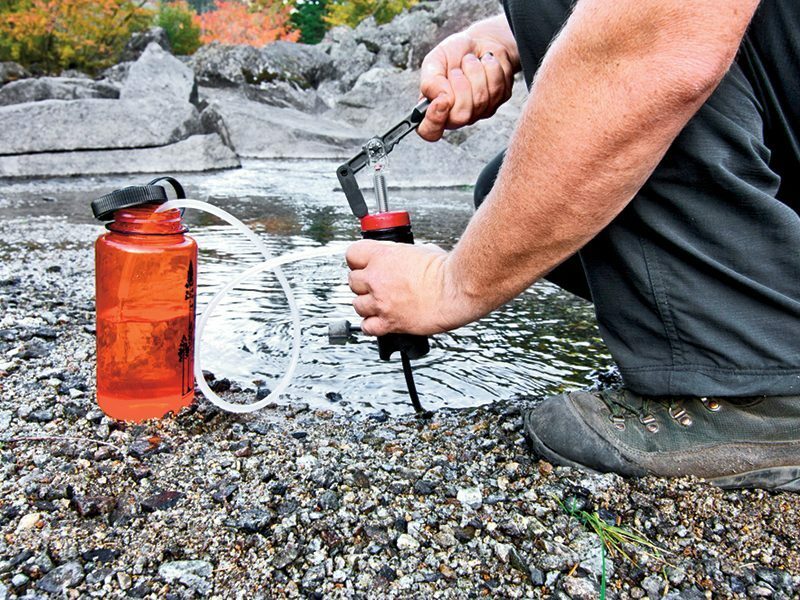 The round headspaces on the cartridge mouth, so there is no adverse effect on accuracy. At first, most rounds were impacting 2 to 3 inches high at 7 yards. I then used a point of aim two scoring rings below the bullseye, to get more center hits. The best five-shot group was 1.87 inches with the very mild-shooting American Eagle 95-grain FMJs. These also just barely won the best average figure for three five-shot groups: 2.56 inches from 7 yards. Remington’s Golden Saber took second place. The real shocker was the MagSafe 40-grain SWAT load, which not only hit dead-center with a center hold, but also had a best group of 2.28 inches. 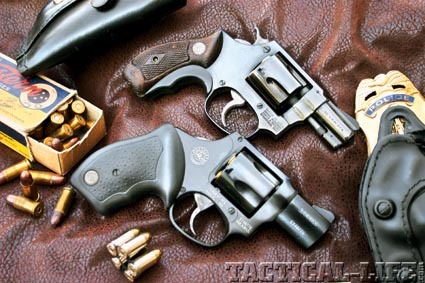 I took the S&W Terrier on a stroll down memory lane. Since I had to shoot the Taurus double-action, I felt it only fair to confine my test-shooting of the Terrier to double-action too. The trigger pull on the 50-plus-year-old revolver was smooth but fairly heavy, and the 0.1-inch-wide front sight blade was harder to see in the fixed notch rear sight. Be that as it may, I was able to produce a group average of 2.74 inches and a best group of 2.47 inches from the bench at 7 yards. An old Tyler T grip adapter was installed on the Terrier and just as comfortable to shoot as the Taurus had been. As anticipated, both were pretty easy on the shooter in terms of recoil and muzzle flip. 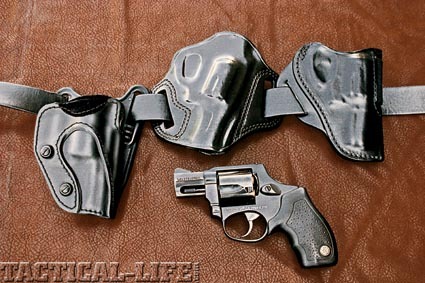 For some combat shooting, I strapped on the Safariland Model 567 holster and loaded up the Taurus Mini with all five Stellar Clips holding Federal American Eagle 95-grain FMJ ammo. I set up a full-size humanoid silhouette target and moved back to a distance of 3 yards. Drawing from the holster, I fired all five shots from a point-shoulder stance using the strong hand. I quickly reloaded, transferred the gun to my support hand and fired five more shots. I reloaded, holstered and moved back to 7 yards. Here I drew, fired two shots, lowered the gun to high-ready, and fired two more shots. From high ready, I fired one shot, reloaded, reassessed and fired an additional shot. I emptied the cylinder with two more double taps and reloaded. At 15 yards, I got behind a tree and came out shooting from the left side for two shots and from the right side for two shots. I then knelt and fired the last round. My point of aim was center-mass and although I had a couple of flyers, most went a couple of inches below the red target center.